In the following pages, I present a number of basic concepts behind a pending patent application to prove that we can extract electric power from GRAVITY-WATER-AIR and MAGNETS. This proposal will make expensive nuclear and coal energy obsolete and reduce oil dependency by driving a car perpetually on pressurized air converted to electricity, thus replacing a major energy need with free nonpolluting electrical power. This will drastically change everybody's life. 1. How to use GRAVITY, Air & Water as an energy source to extract electricity. Presenting the Ultimate Renewable Energy Engine (UREE) proven and demonstrated with sixteen (16) applications. 2. How to apply GRAVITY to a futuristic low-cost traffic system, by designing a cheaper, 500 mph GRAVITY Levitated Bullet Train, linked to Hybrid-monorails - still retaining a personal, rented or public owned electric automobile in a new integrated approach, thus resolving the mass transit vs. a personal vehicle quandary. 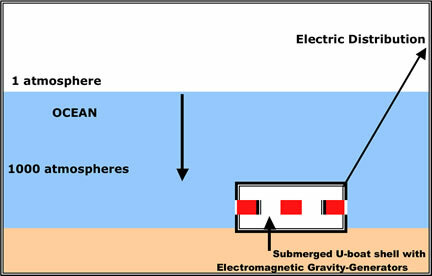 A GRAVITY differential below sea level will exert a water pressure ten thousand times higher than the Hoover Dam, thereby creating “unlimited” electricity. The laws of physics demonstrate that any accordion bellows will compress air on the ocean floor. When applied to gravity motors, it will generate unlimited electricity. It works when a differential GRAVITY potential is converted to KINETIC ENERGY in motion, which can be transformed into ELECTRICITY. That is accomplished by using a standard, modified steam-diesel engine linked to a flywheel, via a crankshaft connected to pistons. Applying proven low-tech engineering could extract unlimited, clean, green energy from GRAVITY, which is a boundless cosmic energy force forming galaxies. It may very well be considered the greatest invention ever in the 21st Century. The green way to harness nuclear energy is not by splitting atoms like CERN but to tap into what sustains their internal perpetual motion. 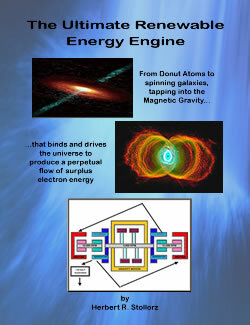 This short concept book will explain the new Donut Atom theory postulating how electrons spinning around a dynamic atomic nuclear shell connect to a cosmos infinite energy source can be harvested across a magnetic bridge to provide a virtual ∞ electric power. Exploiting and converting safe nuclear energy (more explained free on the Internet) in a novel method detailed in my 5th Babushka egg concept book about a simple Donut Atom model written a few years ago. It rationalizes a hidden energy path where magnetism, as the driving force inside the atom, creates electricity to bond atoms into molecules. This magnetic energy glue can be safely extracted as “electricity profit” from magnetized gravity via manipulated kinetic differentials. These pages describe a new method that imitates the Hoover Dam perpetual motion water pressure system creating electricity. The principles in this book raise it to a higher technical level using pressurized air media so that it becomes a portable energy source. This new innovative technique utilizes known standard industrial mechanisms configured into various (UREE) GRAVITY MOTOR designs packaged for different applications. All extract a nuclear magnetic force from gravity linked to renewable kinetic potential, which is the same as the Hoover Dam principle that produces energy as “electrical profit” generated from an immense gravity potential. But it makes no sense plugging in a $65,000 dollar hybrid-electric car into the Hoover-dam electrical outlet for a recharge of $18,000 Lithium batteries when the immense gravity energy can be packaged as compressed air into a small wheel-chair green bottle to energize just one little single cylinder in your car linked to an electric generator. That gives us additional free electricity if linked to the atomic critical resonance frequency now enhanced in this Third Edition of the 9th Babushka egg concept book to understand physics explained better. An experienced hi-tech inventor with a proven track record of results and patents. an educational charity to further biblical knowledge linked to true science. Spending some of my retirement caused me to become a modern Jonah with a big fish story to give warning to our present civilization on the edge of a massive apocalypse. My advice: Do not mess with Elohim, the Creator God, who gave each of us Life and can take it away prematurely resembling what was recorded in history even confirmed by Jesus. When mankind reaches the point of total evil to destroy all life on earth, we will see a repeat of what happened to the Atlantis civilization on 5 February 2287 BC, which utterly perished by an asteroid strike. That impact caused an earth axis wobble that will finally come to rest on 21 December 2012 after 4300 years. Ignorant scientists misled by an evolution religion do not know that this asteroid strike shifted continents and triggered a great worldwide flood causing massive extinction. The record of these events is embedded in geology and reported in the Bible by Noah. I have further proven this thesis with evidence from many ancient stone-bronze-gold clocks exhibited globally in various museums. God’s judgment of human affairs is verified by many more historic witnesses like Sodom and Gomorrah. If you want to know history from a metaphysical perspective and desire do be acquainted with the ONE ELOHIM, check out the Babushka egg concept books free on the Internet. They are designed to widen knowledge horizons 360⁰ by lifting modern science’s curtain to reveal many metaphysical laws of nature paradoxically proven by Bible prophecy, which is “history written in advance”. If you are intellectually inclined and want to expand your MIND to reflect on the Elohim introduced on the previous page, check it out free on the Internet. I have worked around the clock to put together sixteen witness models of perpetual Gravity Motors creating electricity. I first will describe the Mystery Energy Trail coming from the cosmos ending in every atom. We live In the middle of the energy path where I discovered a way to splice out some energy with five new inventions based on ten fundamental Gravity Motor designs. If the energy conversion commercially works, these motors will generate perpetual profits from electricity generation and sales. Unfortunately, my first text go around was too convoluted because it reflected how much I did not understand about theoretical physics since I had had no formal education in it. When God implanted the idea to link science with the metaphysical perspective, it took some time for me to grasp and communicate what God revealed in little chunks. Whom will he teach knowledge? But God opened my mind and used my applied science experience as an inventor to finally make it more believable to me in concept. Then it became possible to present a theory for my fellow scientists who have never heard about new scientific information built into the biblical text. It is difficult for most to comprehend this approach because globally most universities enforce an unscientific evolution religion linked to brainwashed deception and lies sold as science. I am grateful I got this far to conclude a German style - English hybrid text. It has been difficult to find a rare editor skilled in logic understanding physics linked to metaphysics never preached in the halls of higher learning or in church. The unknown in science can only be comprehended through metaphysical revelation but must be confirmed with logic and based on proven historic physics as much as possible. In the final test for the quest to discover truth, theoretical opinions must present three witnesses. Ultimately, the revealed Mystery Energy Trail will only be or made clear to those God has appointed. Much will not make sense to those readers biased in an unscientific evolution theory not matching new discoveries like light going 300 times faster or the international World Standard Kilogram and its 6 sisters changed after 135 years will lead to correct Einstein’s theory and will make nuclear-coal-fossil-oil energy OBSOLETE. I combine new concepts with metaphysic laws rejected by a university environment, which have forgotten the history of mankind recorded in the Bible now thrown out globally from every classroom. I present enough witness evidence information from science to prove a new hypothesis summed up in 80 pages, which is published on the Internet to expose new ideas in 9 Babushka egg concept books to find answers we all had since childhood. My presentation is linked to the other 50%, forgotten metaphysical concept writings of Sir Isaac Newton, as some are stored in the Hebrew University’s Jerusalem basement? His great truths of science embedded in the Bible are once more proclaimed and expanded in nine Babushka concept books published and available free on the World-Wide-Web for everyone to examine. Their historic-metaphysical knowledge will benefit the next civilization after 2018 when God’s Kingdom will be established on Earth according to Daniel’s (518 BC) prophecy calibrated to a fixed earth axis wobble ending 21 December 2012 and correcting our Gregorian calendar. Adding to my energy journey may I present just ten witnesses from the list of inventor-scientist circle among the hundreds from the past century persecuted and suppressed by the establishment that have triggered an innovation ice age in science by a Satan inspired unscientific atheistic evolution religion causing mostly deficit disorder symptoms in students ending with a brain-dead MIND and lost the ability to think in LOGIC anymore enforced globally in every university and governments suppressing TRUTH. In any court of law needs minimum three witnesses to establish facts as the time has come should no longer be silenced now nearly 7 billion people living on this planet running out of energy and food. This last generation of the 21st Civilization must stop pursuing a destructive path in danger to annihilate all LIFE on earth not found in the universe or will be judged by ELOHIM. Check his warning from another JONAH come to the global Town Square announcing: "Time is up - wake up, the prophesied APOCALYPSE judgment has started!” The many witnesses are pointing to suppressed free energy we cannot possible deal here in this energy trail Babushka egg journey and only point to headliners the Internet much better reveals information now available for anyone who wants to widen a knowledge horizon pursuing TRUTH not allowed in universities controlled by a corrupted powerful atheistic priesthood enforcing their evolution religion based on unscientific fairy tales. 1. The Bible presents two fundamentals not understood by theologians. The first verse of Genesis reveals that when infinite light [∞E²] is spliced out into two entropy laws, it created a “darkness” energy (evening-morning) that caused a time dimension to appear. 2. However, when the infinite ∞ light is converted to a second lower entropy level, it shows how elements are formed and crystallized into matter by a visible subordinate-reduced light energy level. This is well demonstrated by investigating the pictures of numerous galaxies through the Hubble Space Telescope (especially the hourglass galaxy). This light energy level can be measured with instruments and was calculated at 186,282 miles (299,792 Km) per second some time ago. Yet when it was recently measured again at Princeton University (2010 AD), they discovered it ran 300 times faster. That would place Einstein’s and Newton’s theories in jeopardy? What is not visible to the naked eye is the invisible energy, which has been understood all along since Adam (4004 BC). (Hebrews 11:3) It is now condensing, according to entropy laws, based on physics, which modern science has forgotten. When light goes faster, we can logically deduct that it must be the cause of a second entropy light conversion to a lower GRAVITY energy level, forming visible elements produced by atoms. This is recognized when investigating Fraunhofer spectral lines that come from many bright galaxies. However, the driving force that causes energy to move is an embedded time dimension, which became the very first act of creation, as recorded in the first verse in Genesis, which declares the beginning of the cosmos. 3. Notice that from a scientific perspective, infinite ∞ light and gravitational energy is the only force without an embedded Time Dimension, frequency-wise. It cannot be measured with instruments. That is not very well understood by modern science that investigates physics from a politically correct worldview, enforcing on society a liberal / socialist, Marx-Hegel-Voltaire-Darwin opinion, while ignoring metaphysical realities. If you are happy with only 50% of the information, to the exclusion of other facts, then be entertained with something else. Presently, many scientists believe that the light from the sun is fundamentally constant in nature; hence, a flawed theory of relativity was postulated. Another theory is surfacing that the speed of light is exponentially changing, as proven with computers. 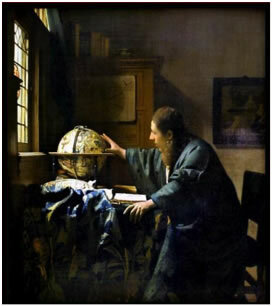 Globally, universities collected data and analyzed hundreds of mean average light measurements from known historical mathematics across a 400-year span. However, the biggest proof is found in ancient stone-bronze-gold clocks, exhibited globally in many museums that measure the moon’s GRAVITY, thus establishing calendars. The Antikythera bronze clock fished out of the ocean in 1906 has 32 bronze gears embedded in it that survived the salt water and was dated 100 years before the time of Jesus Christ by a faulty carbon dating method. However, it is much older, if you understand the mechanism of that clock. It calculated out what gravity was over 2400 years ago. Therefore, ancient clocks exhibited globally in many museums are still a mystery to most scientists. They contain ancient secrets that are not understood by our university establishments, but they are now deciphered in my third Babushka egg concept book that describes new discoveries. Modern physics does not teach closed-loop integration. They have not yet defined how atoms, expressed on a micro-world level, expanded into the galaxies macro-world or by what force. Therefore, they cannot formulate a unifying theory on how Gravity and Electromagnetism, Strong and Weak Force are looped together. Only the metaphysical perspective will bring it together with logic from a different outlook, collected by many discovered scientific facts and summed up in my evidence trail, explaining what the infinite (∞E²) and GRAVITY force is, which is now better postulated. 4. Infinite ∞light is a cosmos fuel and is converted to Gravity when creating mass inside every atom nucleus, which reflects on and into the sphere of TIME and SPACE. Embedded in mass is Gravity, the second entropy static energy force, but when moved once again, it becomes kinetic energy, doing work much like what is expressed inside every electrical motor. Transferred Infinite ∞light energy in motion, when converted to Gravity in motion, now becomes visible and is expressed as kinetic energy, crystallizing and creating atoms. This is the summa total of all mass in existence, as photographed and seen with the Hubble Space Telescope. Checkout the total Fraunhofer spectral lines bandwidth spectrum that is transmitted to earth, and it will open up the inner structure of the cosmos, showing us what matter is, when we are investigating galaxies. 5. The slower second entropy, speed of light, that is now visible to our eyes is not constant and is at different points in the universe. It is not traveling straight, which confuses some science quarters that are postulating wild red-shift theories, projecting a “La-la” cosmos. They do not understand physics and are void of logic. Energy level reductions are dependent on the interaction of total mass encountered in the time/space continuum, as measured from the point of exit of the black hole, concentrating (∞E²) energy, where all the galaxies are born. They begin to find a home in order to crystallize out as an element, which is proven with Fraunhofer instruments. 6. Gravitational forces are the result of infinite light interacting and reflecting against mass (molecular atom structure in the time/space continuum), thus ∞light-gravity, two parallel energy forces, provide the sustained fuel needed to support everything in existence. Every atom needs fuel to continue; otherwise, it would return in microseconds and collapse back to the Big Bang Dot, where our universe started. We have examples of GRAVITY energy conversion in the pendulum cuckoo clock, which works in with the same principle as an atomic clock. Both need a small amount of gravity at a given point in time, in order to keep it running, just like our body or automobile needs fuel, too. 7. On the molecular level, every subatomic particle continually receives an added portion of energy for its existence, which is equal to the summa total of its gravitational force/mass, resulting in the nature of the real world, as we perceive it. Time does not exist inside of the black hole, which is conversely expressed in math, when the velocity of light reaches or becomes: ∞ INFINITE, at which point, TIME then becomes ZERO in a teeter-totter relationship. 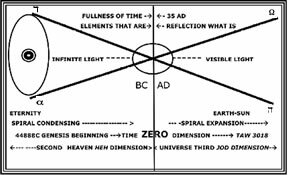 The world inside the cosmos loop of TIME /SPACE continuum (this world suspended in the space we live in) is seen and is now categorized with our ∞MIND into various elements, which are formed out and controlled by specially-designed, embedded microcode intelligence. It is surrounded by a rooted second entropy GRAVITY force, which is recognized in science as defined by Newton and is now expanded. Matter forms complex DNA genes controlled by intelligence codes that develop into composite structures like intricate chemical compounds, which are also embedded with microcode functions according to entropy laws only. Nuclear reaction or electricity is therefore a second entropy force conversion caused by gravity moving at different kinetic energy speeds, itself created from first entropy infinite energy exchange. All of Newton’s laws are still applicable, provided we adjust for the IPK, world standard kilogram in Paris and its 6 sisters, which changed its weight. Faster light changes (recently measured in Princeton laboratories) caused gravity changes that are also linked to an energy loop coming from the cosmos. We are still connected to the black hole energy source of our own galaxy, as seen by looking through the Hubble Space Telescope. 8. In physics, GRAVITY is in a teeter-totter relationship with light, just as light is in a teeter-totter relationship with a time dimension. Time is measured by clocks. By connecting the dots, I recently deciphered a number of ancient bronze-gold clocks exhibited in many museums, which tells us that gravity/time was measured quite differently before Jesus Christ’s calendar, which needed a correction of 35 years. Julius Caesar added 62 days a year and Pope Gregory added another 14 days. When the speed of light recently changed 300x’s faster, as measured by a Princeton laboratory, we needed to add another 4 days in our Gregorian calendar once more, across the total time bandwidth of 7000 Hebrew-Aztec calendar years (4488 BC-3018 AD), which included the asteroid that caused the earth axis wobble 5 February 2287 BC. Check out the ancient Astrolabe clock and find out why someone would invest 125 lbs. of pure gold to tell future generations about a TIME DIMENSION theory. In the Babushka egg concept books, many new scientific facts are integrated into a fully-rounded 360° perspective that will expand our vision from a physic - metaphysical angle, overlaying it with 6000 years of human history. For reference, an audit trail is included at the end of my story. “Gravity is not an energy source”, declare the products of universities, controlled by the energy industries; you don’t get your degrees unless you conform to this farce. Rather, GRAVITY is the FUNDAMENTAL ROOT of ALL ENERGY forms. You can trace all energy forms back to its root form of gravity. Every element of mass greater than the H1 atom is a product of gravity; H1 has its own gravitational attraction, suggesting that gravity is a property of mass; therefore by default, it has kinetic energy. Fusion in the sun is caused by inconceivable compressions, which is a result of gravitational kinetic energy. Gravity is not considered as an energy source, simply because it breaks the laws of conservation [quote] E=mc², which is the transformation of mass into energy waves. Fusion could be one manner of this equation, seeing that it happens in the sun; the other manner is temperature chain reactions (burning). The reversal of this equation happens with photosynthesis energy from the sun, which is turned to mass (biomass), fossil fuels, hydro-carbons etc. These are secondary energy sources, which fit neatly into the laws of conservation. Gravity is a perpetual source of mass-to-mass attraction (kinetic energy), which is only proportional to the amount of mass and not proportional to usage, meaning the amount of kinetic energy from gravity is limitless (perpetual), as long as the attracting masses remain the same. As we can see with the tides, waves, buoyancy, hydro-kinetic oscillation and 20% wind, these are all gravity and kinetic root sources that can be converted to electricity, caused by the moon’s orbit in relation to the earth. Non-solar, dependent, perpetual energy existed and this has been on going for billions of years. Imagine the total amount of kinetic energy used in that time. Have the gravitational forces changed? In answer to the question: Not only can electricity be generated from gravity, it can be done totally green, which is perpetually in harmony with the planet. How long does something have to go on for before it is classed as perpetual, because not even the universe will last forever and ever…or will it? To feed a popultion 1000 years ago, it took 80% of the farmers to grow food. In the Middle Ages, it took 60%. One hundred years ago, technology invented labor-saving machines, thereby reducing the percentage to 35%. Work is now performed by gigantic machines and robots controlled by computers, which reduces the number of farmers growing our food to 5%. I made a list and numbered some energy sources that I converted into laborsaving work, which gives me free time to go to the beach or drive around visiting friends. The stores are filled with food grown around the world, therein bypassing seasonal products, making availability no longer cyclic. What looms on the horizon is that oil, coal and nuclear energy will eventually end. We need to look for different, converted energy sources such as hydrogen, wind, solar and water, but the greatest unlimited potential energy source is GRAVITY and OCEAN-WATER. Looking into the sky, we see that gravity is forming gigantic galaxies and even runs my cuckoo clock for free. Could gravity, coming from a cosmic source, replace all the other energy forms and also be free? In the meantime, the energy cartel moguls lie a lot and brainwash everyone by saying that nuclear energy is the cheapest energy source available to mankind. They say that we need to build more power stations in order to start over again, as the old ones built 40 years ago, need to be replaced. Obscene profit is the motivator for their relatives and friends. Yet, like a criminal professional gambler, hiding a card in their sleeves, they are not showing the real cost of the disposal of the nuclear waste, which should have been averaged across each kilowatt produced. The real cost magically disappeared, hidden in the US National Debt that owes trillions of dollars, where even the US Congress dare not reveal it. Tons of money, billions, is spent every year on stupid cyclotrons like CERN, feeding a bureaucracy that believes in evolution religion fairy tales that do not know what an atom is. For 40 years, they have and are still smashing the embedded nuclear intelligence code and continue scraping it off like junk residue stuck on the Nebelkammer wall, much like manure on a dairy barn wall. Therefore, they have not found a unifying theory regarding how gravity and electro-magnetism, as well as the strong and weak force, are connected together to form a universe. However, why are the many free, clean, alternate energy sources suppressed, which should be redirected to our national policies? Why not use low- tech solar panels, splitting water to gain clean hydrogen, which could totally (and cheaply) fuel all our 21st century needs, globally reducing the horrific pollution in the air, land, rivers and oceans, which is changing the climate? On the bottom page, I’ve collected a number of energy applications (and I sure could add more) that give us an overview and prompted me to have another viewpoint. Perhaps we need to take a closer look and remove the energy moguls from office. They will no longer have an excuse when they read about the biggest invention that the establishment always says is “not possible”, but they should put it on the list for a future, unlimited, clean energy supply for the next generation of mankind. On each side of the crankshaft attached is a flywheel. There are two. Suitable battery, capacitors, switches and other control article. 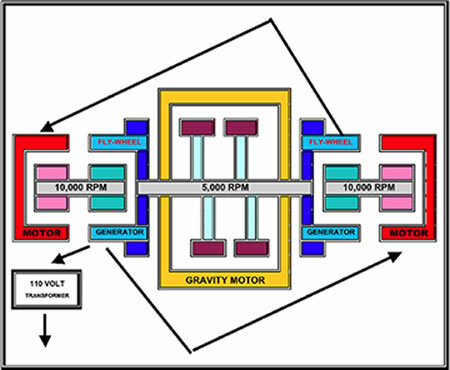 How Does the Gravity Motor Work? Electrical Energy is generated by a still unknown cosmic magnetic-bridge explained in my new invention extracting electricity from a “gravity-differential-potential” related to atoms the source of electricity. Science analyzed everything connected along two wires but no information exist what is on the other side of an electro-generator exposed to high pressured water or steam perpetual flowing which results in perpetual electricity via turbines. This report is different, as it will explain scientifically the other unknown generator side-extracting surplus Electrons, which is electricity from compressed oxygen atoms, which becomes the media-fuel. Therefore, it can become portable and stored in a steel air tank-bottle and used perpetually, like a Genie Spirit escaping but must return to the ∞ nuclear energy source. When a differential media pressure (water or air) is decompressed inside a turbine or within a motor-cylinder, kinetic energy is released according to entropy. That causes free moving electrons to be pushed over a magnetic-bridge levitating around the outer nuclear (-) magnetic shell of artificially compressed oxygen atoms now redirected and forced by a electric generator magnetic field emerging on the other side expelled as perpetual free Electricity Profit. However, for perpetual motion to work, the oxygen gas is recycled to imitate a steam or Hoover-dam flowing water principle. Using oxygen enriched air will make it portable but must be returned to the same piston which squeezes the pressure back into the same air-tank now restored 100%. It functions as a compressor which allows the stripped naked negatively (-) charged electrons returning from the generator to recombine once more to the original oxygen atoms and molecules for a (+) recharge. Or in analysis, the white electrical negative (-) wire must return in a ∞ loop to the same generator-winding source in order for electrical energy to flow. That can be accomplished with a GRAVITY MOTOR using gained kinetic energy inside the cylinder and is transferred to a flywheel via a crankshaft. The motor crankshaft has a flywheel attached on each side to permit perpetual motion for the generation of electricity. But both flywheels have dual functions and must have embedded a hybrid electric generator ∞ linked to a standard electric streetcar motor. The flywheel stores kinetic energy from the released gas pressure inside the cylinder’s downward motion and transfers the kinetic energy into the flywheel, which is needed for the return trip, thereby compressing the same gas back into the pressure tank. Yet in order to gain electricity in perpetual motion, each flywheel has an electric generator stator embedded. The generator’s rotating armature is connected to the same shaft, to a rotating armature of an electric streetcar motor, thus jointly turning on the same axis, which is linked to supporting ball bearings. That is duplicated on the other flywheel crankshaft. The flywheel is turned by the gravity motor crankshaft at approximately 5000 rpm, which turns the outer generator armature. The generator shaft, which is linked to the streetcar motor axis, it will now create a current that is carried over to the other flywheel streetcar motor field winding side. That newly created current will turn the shaft of the second motor, gaining speed, when added to the crankshaft speed. Since the second streetcar motor is connected to the second generator, it will generate electricity also, but it must be fed back to the first motor field winding side, which in turn creates more electricity. Electricity is gained from the differential of speed on either side of both generators osculating back and forth, which now accelerates as they all are linked to the same crankshaft with the motor receiving added electricity. The speed of the generator internally keeps increasing and feeding it back to the other side; therefore gains perpetual motion for energy to flow. Both shafts of the generator’s streetcar motor turn counter-clockwise along the crankshaft should be restricted to a velocity of 10,000 rpm or it will explode. The flywheel, looped together with four (4) or more cylinders that are connected to the air-gas pressure tank, will eventually be confined by eddy currents and by a full turn of 360⁰ of the crankshaft, which will max out the speed with excess electricity spliced out, which is considered Electricity Profit. In order to return the high pressure of the spent cylinder for perpetual motion, a number of spark plugs must be added to each cylinder when fired from a capacitor, which heats the return air a little and will now expand the gas pressure inside the cylinder on the return cycle to over 100% of the original gas tank pressure, which is applied to each piston. It momentarily creates a higher power when argon-oxygen gas expands and adds kinetic forces to the return pressure; therefore, according to entropy, it pushes back the compressed gas with a higher force still helped by the flywheel crankshaft, in order to restore the piston for yet another cycle with the original air pressure unchanged. A higher energy force will always go one way directionally and cascade to a lower level. Kinetic energy can be stored in a flywheel. Electric energy is produced when a magnet is pushed through a copper wire loop. Many loops create electricity. Perpetual motion is considered when all the above is moving indefinitely, theoretically. What shakes out in the form of electricity is beneficial to mankind. I call it electricity profit, an unlimited, cheaper, electrical energy for the benefit of mankind, fueling the next 21st century and perpetually beyond – my claim. When I started the venture to design a possible gravity motor deep below sea level, I was not prepared to spend a number of sleepless nights on it. The problem seemed like an impossibly hard nut to crack. Imagining a Hoover Dam power station deep below the ocean surface appeared to be a crazy idea at first. However, my gut instinct told me that the idea of utilizing a gravity differential a thousand times larger than the Hoover Dam could work. Potentially, the benefits for our civilization are so large that the development of a functioning gravity motor should get the Nobel Prize. Even global governments would be happy too, creating a growing tax base. Future generations will benefit and be blessed by the greatest invention in this civilization to provide our rising needs for more electricity. I hope that challenge of converting a free, existing power from the sky and transforming it into electricity will be picked up and continued by someone more experienced and intellectually inclined towards engineering work that deals with a high pressure differential, such as demonstrated in the Hoover Dam. I need someone with the specific expertise to point out how this idea could be implemented to make it work cost-efficiently. As a philosopher with a hi-tech background, I will present a few applications that will span multiple ideas, with the hope that others would build further, thus expanding the challenge for the greatest invention in our hi-tech society. My base patent application is very specific and will only cover the fundamentals of physics, as described in my new atom theory. This new atom theory, which was recently published, became three Babushka egg concept books, as so many scientific facts piled up, forming the foundation that will lead to many more applications, depending on their purpose. It will also explain Global Warming from a new perspective, as most scientists are misled by universities that falsify data and lie a lot, in order to get another government grant. They will never find out the real reason. It is like barking up the wrong tree. Let’s examine a few examples in the next illustrations, which will demonstrate how gravity, as a perpetual energy force, works. For a better understanding, I will start first with the ocean floor and how an infinite gravity energy differential is utilized and converted to generate electricity. The Hoover Dam project basically analyzed and converted a gravity differential into usable electrical energy, which is carried overland by wires through a power network to the consumer. 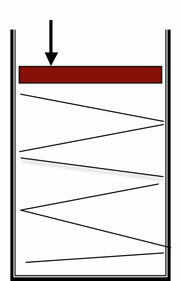 To better understand how gravity exerts pressure, I first applied the principle on levels below the ocean surface. However, I discovered that I could also apply it to levels above the ocean, too. If it is allowed by the energy cartel, it could be considered the greatest invention ever in the 21st century. My cuckoo clock is proof that gravity conversion works. You will understand my gravity principle better, which is now postulated in Babushka egg concept books. All that is needed is to add a little gismo to a cuckoo clock, replacing the chain, and it would run forever. That same principle exists inside the smallest world clock (useful to NASA), which is an atom. It is now functional and applied globally, in order to tell time more accurately to a fraction of a Femtosecond pulse, which is needed and linked to computers. That could be checked out in my neighborhood by visiting NASA (being a little smarter) who used atoms that had not been smashed, only to discover that atoms behave like clocks, which are needed for space travel. They could tell time more accurately and run forever due to gravity, an embedded mystery energy force that continues in perpetual motion. I just expand on the principle applied to the Hoover Dam because it is larger. Some modern skyscrapers rest on springs of compressed rubber pads, for insulation against the forces of possible earthquakes. That is a gravity differential also. It could be applied to a pressure piston designed with a huge top weight to compress a liquid, thereby transferring an invisible gravitational energy that is useful for perpetual motion. “If static gravity energy is allowed to move perpetually, some free energy is left over as profit” if converted to electricity." When looking at pictures of the first airplane built by the Wright brothers, we see that same principle. When a gravity pressure differential force, which was discovered later, was moved across wings, it created lift in order to keep heavy mass levitated. Their first airplane was a far cry from today’s double-decker jumbo jets that are as large as the Zeppelin, but five hundred times faster. Therefore, think big! For power generation on a commercial scale, imagine a submarine body containing a gravity generator near the deep edge of any offshore ocean, or use the weight of a skyscraper underneath the earthquake damper. All utilize a pressure differential, like airplane wings, or the same principle applied to the Hoover Dam turbine blades which convert energy significantly less expensive and pollution-free, without dangerous nuclear fuel waste, which kills all surrounding life and horrendously expensive to dispose of. Perhaps a scaled-down consumer prototype version should be designed first, depending on the required power output. It stands to reason that if we put our cuckoo clock on the bottom of the ocean or high above on top of a skyscraper, it will work. Due to the gravity/pressure differential, the applied weight only needs an automatic cycle impetus to make it run perpetually, long-term. Check out my new Babushka egg concept books that connect Biblical prophecy with a new atom theory, revealing that every atom needs to be refueled with infinite light energy converted by the second entropy to gravity, for the cosmos to continue. The night sky reveals a universe of billions of chandelier clusters with the lights on to demonstrate that continued energy is needed to exist, just as automobiles do, and you also. A thought to ponder: Investigating the possibility of my gravity innovation, we see that it is almost a perpetual motion machine going forever like an atomic clock. Nothing like this has ever been thought of by science possibly. It works because of how it is connected to an infinite energy source that comes from beyond the cosmos. The use of that free energy started 100 years ago, when we began converting magnetism into electricity. Tell me where the electricity comes from, fueling billions of lights globally, and is waiting behind every wall switch to be ready in less than one second? What is its nature? It teaches us the principle that only when energy moves is it useful and considered profitable. This new approach, coupled with better understanding of that mystery force, could be the fuel for the next civilization, which would make the horribly expensive nuclear power stations obsolete. Our grandchildren will be happy because they will not be burdened with guarding deadly nuclear waste for 100,000 years; always fearful of another accident like the one which destroyed the city of Chernobyl and surrounding farmland in Russia and recently Japan 2011 and a few other places. Those large areas are now totally empty and void of all life. It is dangerously contaminated for a long time, but the cost is kept secret by the government who lie a lot, being united with the energy cartel who are only interested in making obscene profit. It also might upset a lot of Arabs sitting on future unsold oil that grossly pollutes our environment, but it could restore America’s greatness once more if allowed by the government. 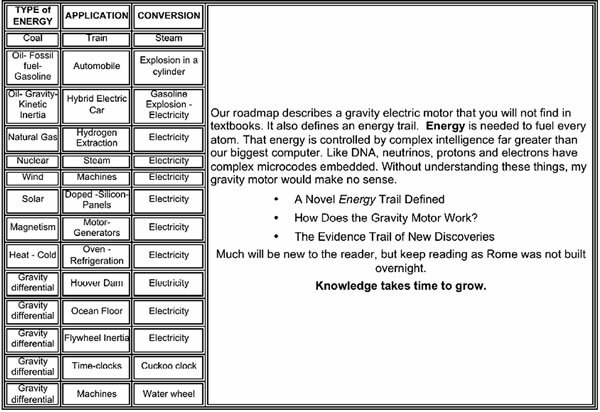 We will now investigate the conversion of GRAVITY into ELECTRICITY from some examples, as well as explain how gravity interacts inside an atom, with a new Donut Atom theory, explained in Babushka egg concept books to widen a knowledge horizon. These are free on the Internet. Examining the laws of physics and overlaying it with the metaphysical perspective, for a fully rounded 360° viewpoint was never concluded by anyone, as it is forbidden and ignored by science. When science is reduced to tunnel vision, it becomes the reason that so many artifacts, exhibited globally in various museums, such as prehistoric bronze-gold clocks are not understood. They still remained a mystery for hundreds of years, as they were not able to find out that the ancients measured GRAVITY. Combining physics with metaphysics will lead to a better understanding about magnetism, what electricity is, how life is embedded inside an atom, where GRAVITY comes from, how it is produced and the biggest mystery of all, infinite ∞ light – the fuel for the cosmos, down to the very level of every single atom, which is controlled by embedded intelligence. That is a full menu and can only give you some appetizers from the same table. I sincerely hope it will challenge your perspective to further investigate the audit trail mentioned at the end of this story, for a clearer understanding of nature, as well as discovering the reason behind our existence. As we search to the outer region of the cosmos to find life among billions of galaxies, we can only find it on one tiny planet, as we look through the Hubble Space Telescope. It is the only place with an embedded historical record across a 6000-year span, which crystallized and is summed up in a unique book called the Bible, the foundation of all knowledge and wisdom for mankind. Sadly, that information is rejected by the education department, who is no longer teaching it to our kids, which is certain to destroy our civilization. Our global society is changing fast and becoming more corrupt morally, having lost the compass. We already see the food chain for mankind genetically collapsing, having been altered by criminal cartels who splice out the original protection immune system of every seed for food - all for obscene profit. It is no longer naturally procreating with the irreplaceable reproduction intelligence, which has been sliced out and will be permanently lost, as it is exchanged for cloning. If you understand physics, it will be linked to the extinction of future mankind and all surrounding life forms. The mystery “LIFE-SOMETHING” is only found on earth; however, it is now in horrible danger of disappearing, according to Newton’s laws. It will terminate mankind on this planet in the next generation, with the food chain collapsing, unless God intervenes. The public is kept in total darkness, comatose and in an ignorant state, unaware of the greatest extinction menace mankind has ever encountered. Therefore, before it is too late, why not venture out on a worthwhile journey that challenges our mortal MIND, to discover a “universe” a little closer to our home, with embedded life, controlled by intelligence. When something is believed by everyone as “not possible” and even conflicts with the education establishment, think back to how science started and when it was still in its infancy. Galileo came around and was forced to be silent, condemned in house arrest or pay the consequences. Our present scientific endeavors lead to high technology, but in many aspects, it has reverted back to the Middle Age mentality, where they believe in unscientific fairy tales, such as an evolution theory, which is void of facts and which became an atheistic religion. An evolution theory is not possible if you understand science, as it violates entropy laws and other laws of physics are avoided or outright denied. Globally, our universities are now controlled by an atheistic priesthood enforcing their biased politically - correct viewpoints on the majority. They are backed up by powerful lawyers linked with Supreme Court degrees and enforced by the police. It is no different than what Galileo experienced during the inquisition period that stopped most scientific inquiries. Creating electricity, along with perpetual motion, from a portable, compressed air tank gets the reaction not possible; therefore, it may be difficult for any patent authority to grant legal protection, as it would ruffle some feathers in the university enclave who read the above headline. Our global education system is sinking further into quicksand. We have forgotten many laws of physics, thereby creating confusion, as observed in some UN global warming symposiums where they are bewildered by falsified data from a prestigious university that can only be straightened out with forbidden metaphysics. Modern science is controlled by opinionated speculations, and they do not know what makes an atom tick. For instance, why keep on smashing atoms for 40 years with bigger machines like CERN, only to create more faulty hypotheses postulated from scraped off junk from the Nebelkammer wall, like manure on the walls of a dairy barn? Thereafter, they applied faulty conclusions to the universe, which left them further perplexed, as galaxies were seen a tad closer with the Hubble Space Telescope. As a matter of fact, it is no wonder that in the midst of hi-technology, no unifying theory exists regarding what gravity, electromagnetism, strong force and weak force are, thus creating a universe and our planet, which is the only place where life exists. When they start out postulating from an incorrect and faulty database, it will never lead to the proper conclusions. It is like building a house on sandy flood basin. An elusive reality is mostly clouded by a biased political and atheistic worldview persuasion, where they spend a lot of money on many unproven scientific theories that are proclaimed yet lack logic, as they avoid the requirement for witnesses, which needs a minimum of three, but this is forgotten in our modern universities in order to elevate an opinion, rather than establish truth. Any new discoveries must first pass a prevailing atheistic pseudo-evolution religious filter, which is void of logic and which globally controls the education of our society, as they now denigrate anything that is not relative to their level of ignorance. This created a widespread mindset that no longer applies logic, but rather slides back to the Middle Age environment which is similar to what Galileo experienced, as they control new information in an effort to keep you silenced by suppressing discoveries with the tools of the inquisition, which is enforced by a modernized police force. However, Galileo’s oppression can no longer be repeated in modern times as long as the Internet exists. The global Internet created an outside forum platform in order to explain new discoveries, which cannot be controlled by an atheistic priesthood. It is a marvelous platform, where rejuvenated or snubbed scientists can voice their new discoveries that are in conflict with a biased politically correct establishment. Demanding legally that only their established science discipline is permitted in universities, which is just a sanctioned colored filter to cover a biased unscientific atheistic evolution religion. Let’s investigate GRAVITY from a different viewpoint, in order to discover that unlimited Kinetic energy embedded in GRAVITY, can be converted into electricity and extracted either from a high pressure differential below sea level or stored in a portable media air tank like a bottled up genie energy spirit. But one more principle needs to be considered. When we throw and accelerate a stone into the pond, it creates a wave, which is a form of kinetic energy. The trick is in how to capture both inertia levels converted into electricity. That can be accomplished with existing technology. Once more, the new UREE motor design applied to modern technology is different by tapping initially into the first entropy force of the stone’s inertia and combining it with the second entropy level force of the pond waves to catch much more electrons and convert them to electricity. Conversely, first we need to have a better concept about what energy is since science has so many wild opinions, as you will soon discover in this report. Do not judge me crazy yet, when I’m postulating and driving around perpetually in my car without an energy source, but let’s sit at the same table with a cup of coffee and listen to an unheard of, new Babushka egg concept story. Egg < or > Chicken? The biggest debate, which is not yet settled in our time, is the answer to the question of, “What came first, the egg or chicken?” From the metaphysical perspective, life is embedded in an atom, which grows according to intelligence and is directed by an energy exchange. For me that is the egg. Again, we have two energy loops such as the ancient ∞ hieroglyph, which presents itself as conforming to two entropy laws. That explains how we can drive around in a car without gasoline, but nevertheless, I am not hallucinating, as I still believe that we need energy that is converted from a different source. The egg starts life and becomes a chicken and both are linked, in order to gain profit, which is a miniature Babushka egg that I call electricity. That is the fuel for the big civilization egg again, right down to the level of my house with a car in front of it that I like to drive around without gasoline, as that has become my story. Where the energy comes from will be another Babushka egg story, and if you have difficulty understanding how energy is produced from the cosmos that fuel every atom. Don’t worry, the chicken Gravity Motor will explain it later and fill in the gaps. There are no books available in any of the universities that even come close to what was revealed to me, although I am still learning and writing it down in a foreign language makes it even worse. After you read the Gravity Motor chicken explanation, come back to this disclosure and once again follow the trail. Expanding a perception regarding ∞ and what it is once more will become profit for your MIND, I am sure. Now let’s find out how GRAVITY works and how it is converted to electricity. Femtosecond pulse 15 (=a millionth of a billionth) reveals how quickly a nuclei of atoms in molecules rearrange during a reaction. Ahmed Zewail, Caltech 1999-Nobel Prize. Go to the next Section.